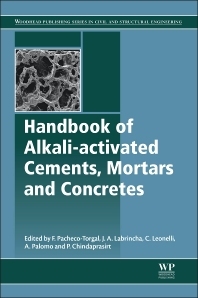 This book provides an updated state-of-the-art review on new developments in alkali-activation. The main binder of concrete, Portland cement, represents almost 80% of the total CO2 emissions of concrete which are about 6 to 7% of the Planet’s total CO2 emissions. This is particularly serious in the current context of climate change and it could get even worse because the demand for Portland cement is expected to increase by almost 200% by 2050 from 2010 levels, reaching 6000 million tons/year. Alkali-activated binders represent an alternative to Portland cement having higher durability and a lower CO2 footprint. Considers performance in adverse environmental conditions. Offers equal emphasis on the science behind the technology and its use in civil engineering. civil engineers, contractors working in construction and materials scientists in both industry and academia. "This handbook is a great impetus for an accelerated commercialization of an eco-friendly alternative binder technology with more in-depth understanding of its strength, weakness, opportunities and threats...will go a long way to fulfil the essential requirements of transferring the technology from the laboratory to the field." Fernando Pacheco-Torgal is a Senior Researcher in the C-TAC Research Centre at the University of Minho, Portugal. He has authored almost 300 publications, including 96 in ISI Web of Science-WoS and 92 on Scopus. Having received 798 citations in WoS (h-index=15) and 1125 citations on Scopus (h-index=18). He has a SCI Platinum h=30 the highest in the field of civil in Portugal. He has also been the Lead Editor of 14 international books, with more than 500 contributors from 52 countries in the five continents. João Labrincha is Associate Professor in the Materials and Ceramics Engineering Department of the University of Aveiro, Portugal, and member of the CICECO research unit. He has registered 22 patent applications, and has published over 170 papers.